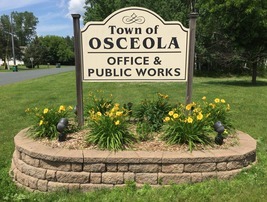 The Town of Osceola is located in southwest Polk County, Wisconsin along the St Croix National Scenic Riverway and adjacent to the Villages of Osceola and Dresser. The Town is accepting Credit Card payments on-line for tax payments and other municipal payments. Click on "Online Payments" at the top left for more information and to make a payment. For more information on requesting an Absentee Ballot or Voter Registration form click on Elections and General Information in the green box above. Forms are below. At the close of polls on April 2, 2019 there were 0 provisional ballots that remain outstanding. Burning permits are required in the Town of Osceola if your fire is larger than 4 feet in diameter. Burning permits expire December 31st of the current year and must be renewed each year before you plan to burn. For burning permit application, click application. All dogs in the Town of Osceola are required to be licensed and vaccinated. Dog license fees are due by April 1, 2019. For dog license application , click application.